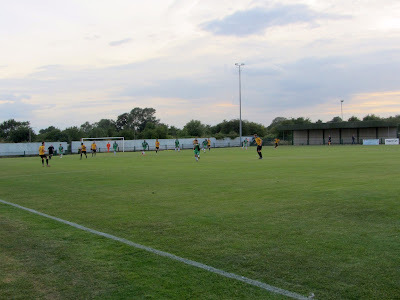 My eleventh ground of 2015 was on Thursday 23rd July at Rookery Hill in Corringham, Essex. 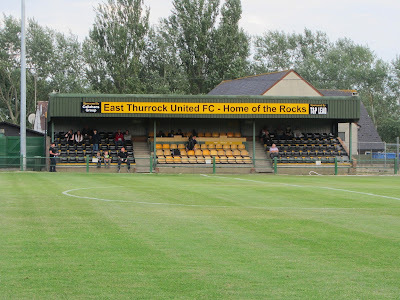 The match was East Thurrock United vs. Dagenham & Redbridge in a friendly. Rookery Hill is on the southern edge of Corringham next to the A1014. The venue is 2 miles west of Stanford-le-Hope railway station. It has been home to East Thurrock since 1984 but the club have their eye on a move into Stanford-le-Hope in the near future. The south-eastern side of the ground contains the main stand - a 160 seater structure which sits level with the half-way line. Next to this there is a food outlet and club offices. The clubhouse is also on this side of the ground though this faces out into the car park. Directly opposite the main stand are the two dugouts with an additional 140 seat stand towards the northern goal. Towards the southern goal there is a covered standing area though the rest of the standing on this side of the venue is uncovered. 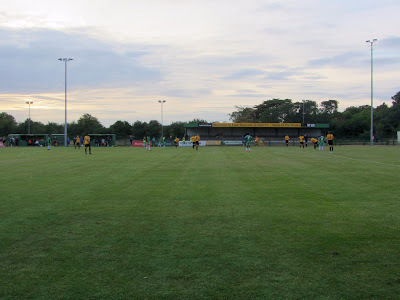 There are no stands behind the southern goal but the area behind the northern goal has two small covered concrete terraces located on either side of the goal. This two are linked by an uncovered wooden platform in the middle. The game was a friendly between Isthmian League Premier Division side East Thurrock United and Football League Two side Dagenham & Redbridge. The Daggers sent a young side to Corringham but took the lead inside 10 minutes. The goal came as the visitors broke from an East Thurrock corner - the ball was crossed into the path of Ade Yusuff who slipped before recovering and unleashing a 20 yard drive into the corner of the net. 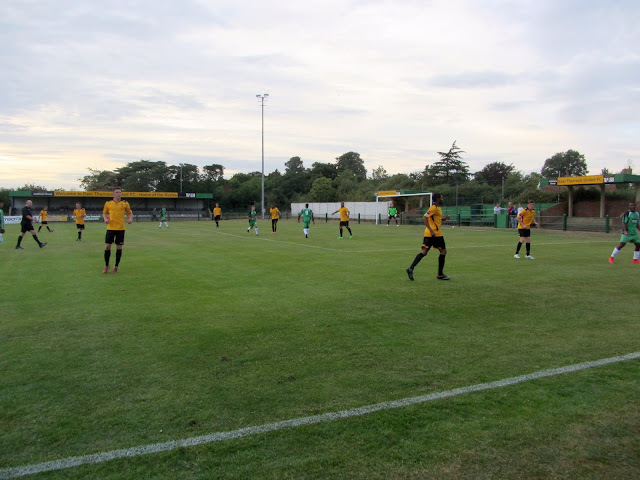 The away side almost doubled their lead in the 36th minute when Jimmy Nottage hit the post for with a good effort from 25 yards. The Isthmian League side should have equalised just after the break but spurned a one-on-one opportunity with Daggers goalkeeper Lewis Moore. The second half was a quiet affair with very little happening until Dagenham sealed victory with a second goal in the 85th minute. A quick free-kick saw the ball played to Cadell Daniel who crossed for Reeko Hackett-Fairchild to stab the ball home from close range.